Today’s guest blogger is Refinceyaa Patterson. 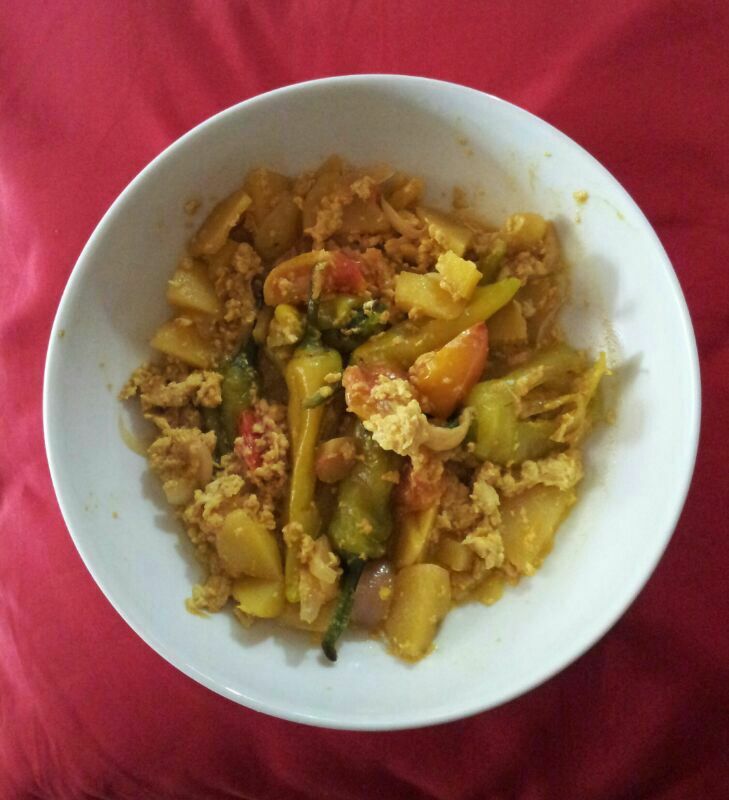 She mentions that this dish is a creation of her aunt who runs a pre-school in Trincomalee and enjoys cooking. 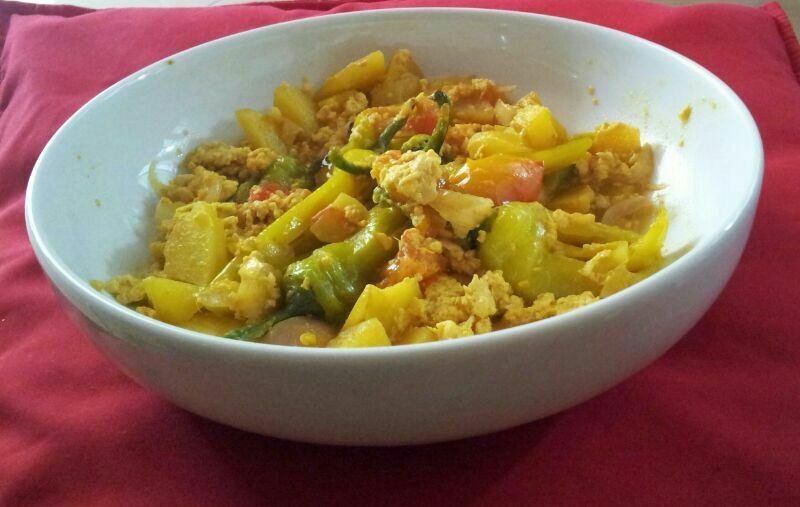 This dish is generally cooked at her home on Sundays or special occasions as it is a favourite of their family. In the continuing South Indian movie song theme, today’s featured singer is Sujatha Mohan. She started playback singing while still at school in the 1970s. After a hiatus in her singing for most of the 80s, she became popular again when A.R.Rahman had her sing in several of his songs in the 90s. She won state awards for some of these songs composed by A.R.Rahman. The first song clip is from the 2007 movie Mozhi (translation: Language). The second song clip is another live performance, this time of Sujatha and Mano, of the song from Bharathiraja’s movie Kizhakku Cheemaiyile (1993). With music composed by A.R.Rahman, this was the song that made me notice Sujatha as a singer. I guess I am partial to folk tunes. The last clip is not a song by Sujatha but that of her daughter Shweta Mohan, who started her playback singing career in 2006. In this clip, Shweta was invited for a surprise appearance on the set of a music contest where her mother is one of the judges. She sings a few lines of a poem by Bharathiyar, my mother’s favourite poet. Hope you enjoyed the voice of Sujatha Mohan and do let me know how this recipe turned out for you! Wash and cut the capsicum into four slices (lengthwise). Add salt, turmeric, curry leaves, onions, potatoes, tomatoes and the capsicum slices to a pan together with a little water. Cover the pan and cook for a few minutes. When the water dries up, add the oil and the optional Maldive fish to the pan and fry the contents for a few minutes. Now break the eggs over the rest of the ingredients and mix well. Add a cup of the first extract of coconut milk to the pan. Bring the curry to a boil and take it off the fire. Today’s guest blogger is Mohamed Muzain. A staff of UNDP, one of his hidden talents became known to colleagues after he cooked a delicious dish for a potluck. I requested Muzain to share one of his famous recipes and he shared his recipe for butter chicken. First, wash and clean the chicken and chop it up into smaller pieces. Rub some turmeric powder over the chicken pieces and keep aside. Next, prepare the marinating sauce. Peel the onions and tomatoes. Chop them up and blend them together. Transfer the puree to a mixing bowl. Add the yoghurt, 1 tbsp of the ginger-garlic paste and 2 tsp chilli powder to the puree. Mix the marinating sauce well. Transfer the turmeric powder coated chicken pieces to the marinating sauce bowl. Ensure that the chicken pieces are well coated. Let the chicken pieces soak in the marinating sauce for at least 30 minutes. Chop up ½ the onion and slit the green chillies in the middle. Heat some butter in a pan and fry the chopped onion, curry leaves, rampe and the slit chillies. When the onions turn golden, add the remaining ginger-garlic paste. Add the cumin seeds, cinnamon and cardamom to the pan. Mix the spices well. Transfer the contents of the mixing bowl, the chicken pieces together with the marinating sauce, to the pan and let the chicken cook on low to medium heat for about 30 mins. When the chicken is well cooked, add a small tsp of chilli powder and the remaining butter. Mix well before removing the pan from heat.